If i forgot anything, put it in the wrong place, mentioned anything outside your mindmap or if you want me to add your funky startup … put it in the comments, but do not expect me to edit the monster. Maybe i will add the big linklist another day. Readers who are tagging this have also tagged O’Reilly‘s What is Web2.0, 37 signals‘ negative top 10, and Dion Hinchcliffe‘s diagrams. 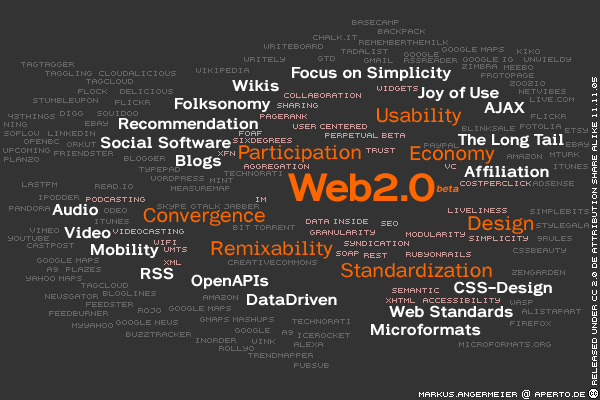 Check out NerdWideWeb.com for localised versions of the mindcloud. In case you are a interested in tshirts, buttons, stickers and mousepads surf over to the official nerdchandise of the web2.0 mindcloud. My computer worked not correctly, many errors. Help me, please to fix errors on my PC.